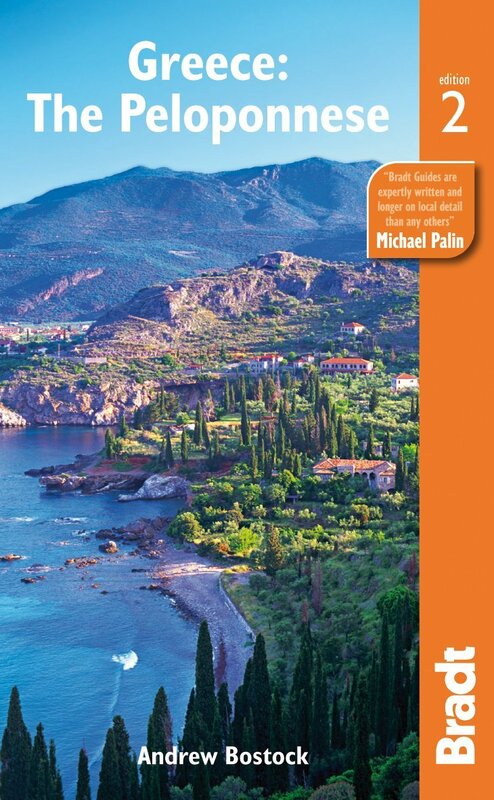 Continuing the Peloponnese travel theme it would be remiss of me not to mention that the nice people at Bradt have let Andrew Bostock update his excellent guide to the Peloponnese just in time for your 2013 excursion. And rather like the paperback of An Adventure it shows a certain house. I think that Andy may have had some influence on this choice of cover! Andy also gets in touch with me quite often, and it was he, working in close collaboration with that other Karmayli expert, John Chapman, who first picked up on the filming of the movie Before Midnight at Paddy’s house. Andy has lived in the area with his family so he is no fly-by-night travel guide author. I have a copy. I know the Peloponnese pretty well having holidayed there on three occasions. There is a lot to see and it is by no means all about the Mani, or Paddy. There is so much more. If you would like to get in touch directly with Andy about travel to the area his details are here. The Peloponnese contains a huge diversity of landscape, everything from the classic image of Greece – white sand beaches and sleepy white-washed villages through to the ancient sites of Olympia and Mycenae, Byzantine churches and medieval fortresses; towering mountains for hiking and skiing, olive groves which produce the finest fruit, and mountains covered in flowers. In recent months Greece has undergone a well-publicized economic meltdown. However cheaper prices and the expense of long-haul tourism has actually led to an increase in visitor numbers. The government is keen to invest in tourism as a way to reinvigorate the country. Specific examples of this are the new year-round flights from Athens to Kalamata and a major new international spa / golf resort in Messinia. Greece is no longer an ‘easy’ travel destination and there as been an increase in the trend towards independent travel, away from package tourism. The new edition reflects this with reviews of the plentiful new accommodation, details of independent tours and activities as well as excellent coverage of off-the-beaten-track sites and attractions. Greek expert, Andrew Bostock leads travellers to hidden villages, sophisticated towns, and to other top attractions – one of Europe’s most spectacular train journeys and the tower houses of the famed Mani. He explores the lesser-known sites and attractions, including details of places not covered anywhere else. The guide is packed with information on agritourism spots, eco-conscious boutique hotels, camping under the stars, rustic tavernas and locally grown produce. Traditionally the tourist season in Greece is the summer, but this is fast changing, with savvy travelers discovering the wild flowers of spring, the joys of the olive harvest in late autumn, and skiing opportunities during the winter. Bird life and marine life are also a huge attraction for visitors to the Peloponnese. The guide also focuses on the colourful life of the traditional ‘paneyiri’ and those who still embrace the Greek spirit of ‘philoxenia’. This entry was posted in Mani and tagged Andrew Bostock, Bradt guides, Greece, Peloponnese on June 22, 2013 by proverbs6to10. The great thing about Bradt, as opposed to other guidebooks which seem to be written by committee nowadays, is that they trust their authors. I did indeed have some influence on the cover, which I chose a) because it’s one of the best views in Greece, b) because you can see PLF’s beautiful house, and c) because you can see where I used to live!